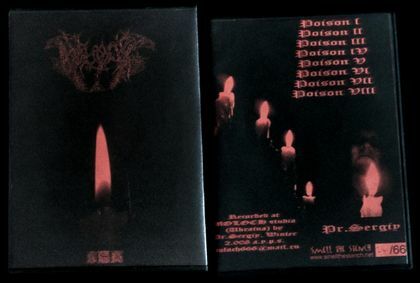 This is experimental noise demo recorded with various noise equipment and analogue recorders at Moloch studio (Ukraine) in Winter 2008 by Sergiy Fjordsson. Track 8 - is a bonus track taken from "Inhuman Teorier" demo 2005 (where original name of the track are "Jormungang Part ll"). Demo inspired by technogenic structures of the world. Originally made for close circle of people. Despire the fact that its a noise demo, some tracks comes with vocals (and of course lyrics), but very distorted and disfigured a lot. This is CDR edition of Smell The Stench Records (Australia). Limited to 66 copies with red xeroxed cover in dvd case. This is CDR edition of Heart Shaped Box Productions. Limited to 21 copies. 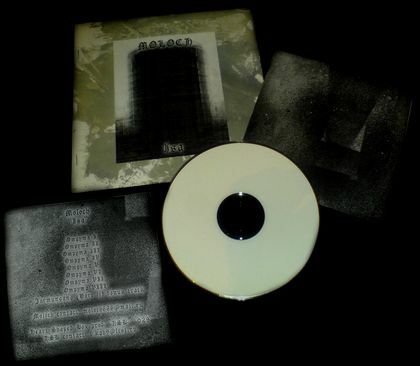 White CDR in b/w xerox envelope, packed in handmade & handpainted package. Many years after original release, label re-print this release in a bit different form (cdr with print, package not 7" size but A5 size and other small details were changed. So, new edition band concider as "bootleg"). Here are no any Cassette Tape, Digital, CD and Vinyl versions of this Demo. Just CDR editions were made. Some songs were remastered in 2016 and some will be remastered later and maybe in future this release be available on any other editions. Possible on Cassette Tape or ree-to-reel in new, remastered and re-structurized form.